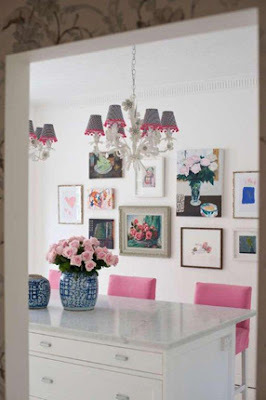 I have loved these pink barstool slipcovers since the moment I saw them on Anna Spiro's blog. 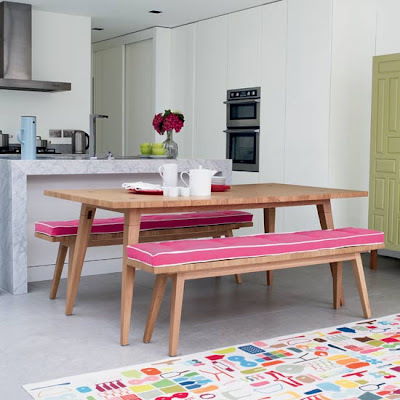 I also love these bench pads I spied on Homes and Gardens. Just had to add some pink myself before I left Chicago. A clever girlfriend ran them up for me out of $1.35 per yard fabric and voila! I got my splash of pink. The new house will have white marble benchtops, so these should do nicely. 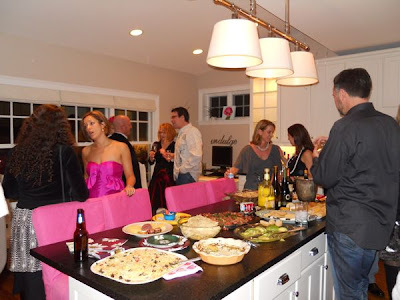 Spot the Huntress in the yummy pink dress. Looks like you have Steve's best side in this photo! We all miss you and hope you are well. T&L send their best to Mia. (I lost my kitty over the weekend and the twins are lobbying hard to get a replacement...and name it Mia).